Made in the UK by manufacturers with years of sock making experience; feel the outstanding quality of this pair of men’s riding socks as soon as you pull them on. 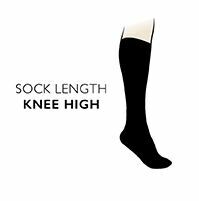 In a traditional knee high length, this plain pair of men’s riding socks will fit neatly under your riding boots. A cushioned toe, sole and heel will offer protection and made rich in cotton, this sock is naturally durable. This high quality SockShop of London sock has been made to last!